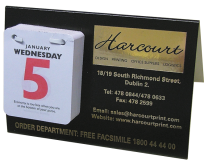 - Large date pad showing 3 months - 12 pages plus headboard, Wirebound - Custom Headboard in Full Colour - Date pad can be overprinted with your company name (additional cost) - Red Day Marker (Optional) - Envelopes extra Sometimes called the Transport Calendar because of its popularity with that industry, however this Calendar can Transport your business image where it matters onto your clients wall quantities available from as little as 50 ask for quotation. 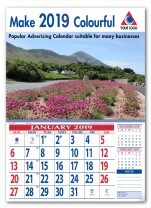 - Economic and popular Advertising Calendar suitable for many business. - Choose one from five varied and Colourful Pictures. - Your Company message printed in one colour, two colour or multicolour - or Customised with your own special design - or send us your images and details and we will design it for you. - Date Pad is sewn onto Headboard. Date pad includes: Moon Phases, Notes, previous & following months. 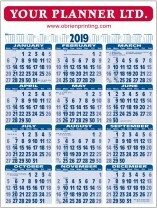 - A Calendar to suit a tight budget but looks great. - With same clear Blue Date Pad as No. 8 - Plenty of advertising space for Your Company message. - Printed in one colour, two colour or multicolour - or Customised with your own special design - or send us your images and details and we will design it for you. - Date Pad is sewn onto Headboard. 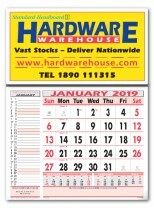 - Very suitable for Shops, Supermarkets, Fundraising for clubs etc. Date pad includes: Moon Phases, Notes, previous & following months. 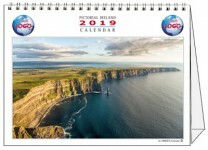 Customise your calendar - send us your photos and logos and let our designers do the rest! Put your name where it matters - on your clients wall! 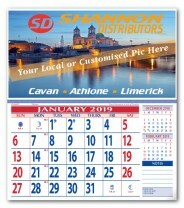 Add your logos / photos to any of our calendars. 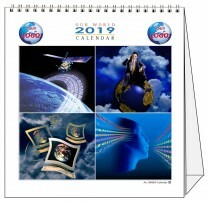 Great range of quality calendars to chose from. Please send an enquiry for more information.